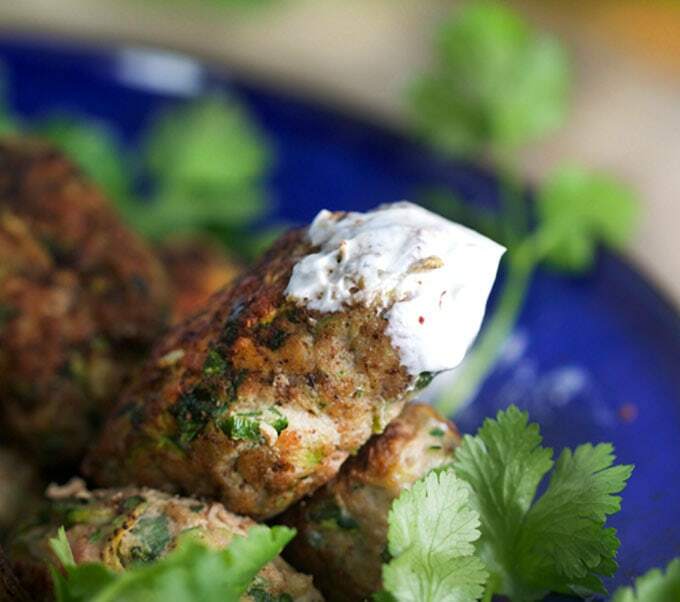 Ottolenghi’s Turkey Zucchini Meatballs are out of this world! They have no bread, no flour and no milk. Just ground turkey, veggies, herbs, spices and eggs in this genius recipe! Great as an appetizer or entrée! Do you have any foods that make you swoon? Maybe for you it’s chocolatey desserts or macaroni and cheese? Meatballs do it for me! Whether they’re stuffed or glazed, Swedish or Asian or on spaghetti with tomato sauce, I find them utterly irresistible. I don’t make meatballs very often because I end up eating waaaayyy too many. 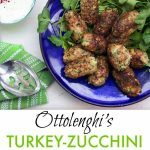 But these turkey zucchini meatballs from Ottolenghi are different, lighter and healthier than most, made mostly from lean ground turkey, vegetables and herbs. The recipe comes from Ottolenghi’s cookbook Jerusalem. If you have the book, you’ll notice that Ottolenghi calls them burgers. I call them meatballs. They don’t look quite like either one. They’re small – two or three bites apiece. They’re served with a lemony yogurt dip and no bun. I like rolling them in an oblong shape because it makes them more like finger food that you can hold and dip. In fact I often serve them as an appetizers. I’ve had them out for many a Super Bowl party. Scoop up about 2 1/2 tablespoons of the mixture and toss it from hand to hand, giving little squeezes to form it into an oblong shape. Three or four tosses and squeezes per meatball should do it. Set each formed meatball onto a plate. Heat oil in a skillet. When it’s hot, tip the plate towards the pan and use a spatula or a knife to gently slide a few meatballs into the pan. Cook the meatballs in batches, turning them until they’re brown on all sides. They brown up quickly. Set the browned meatballs on a parchment-lined baking pan. Finish cooking them in a 425º oven for 6-7 minutes. I love to serve these with lemony yogurt sauce on the side. This yogurt-based dip features sumac, a beautiful deep red spice with a lemony flavor that’s very popular in Middle Eastern cooking. When you pass by the fridge looking for a quick tasty snack, these are hard to resist. They even taste great cold. 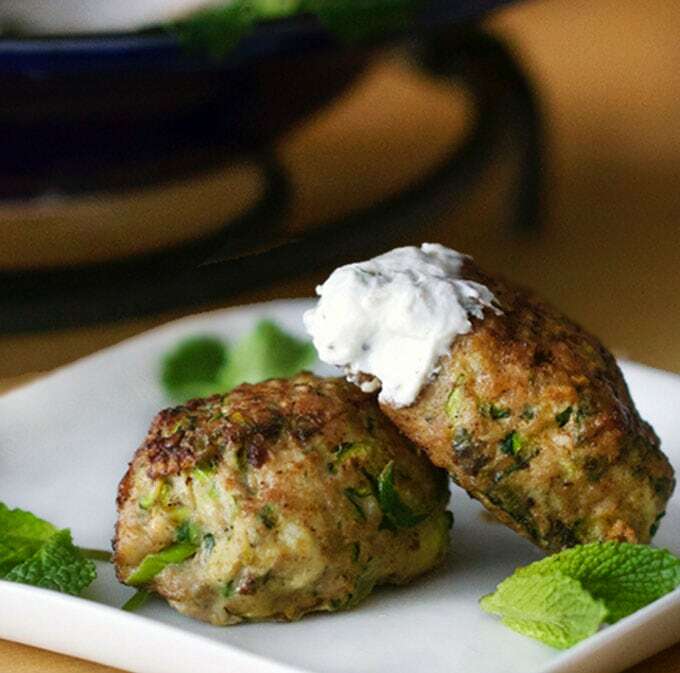 Here’s the recipe for Turkey Zucchini Meatballs with Lemony Yogurt Sauce. If you try this recipe, I hope you’ll come back to leave a rating and a comment. I’d love to know what you think. * For a lower fat sauce you can swap out the sour cream for low fat yogurt. The taste is a bit more tart but still delicious. Make the Sauce Combine all ingredients. Set aside or refrigerate for up to 3 days, until needed. Heat 2 tablespoons oil over medium heat in a large skillet. Slice half the meatballs into the pan and brown them on all sides, about 4 minutes. Carefully transfer them to the baking sheet. Repeat with the rest of the meatballs, adding extra oil to the pan, if needed. Slide the tray into the center of the oven and cook for 6-7 minutes, until cooked through. Serve with lemony yogurt sauce. On occasion I provide links in my posts to cookbooks or other products, available for purchase on Amazon. If you purchase a product through these links, I receive a small commission with no extra cost to you. I am so glad I tried these. They are yummy! Love the mix of flavors. Thank you! I made these tonight as an appetizer, since the main course (fresh, homemade artisan bread and homemade french onion soup) comes later. These are light and delicate, but packed with flavor. They aren’t hard to shape if you just follow the directions and toss back and forth. They held together just fine. 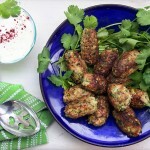 They are really delicious, and with the lemony yogurt sauce they are absolutely fantastic. I think these are going to become a favorite in this house! I often make these as an appetizer too – love them as a starter. I’m so happy to hear that you enjoyed them. The rest of your dinner sounds amazing too! Thanks for letting me know Dave. I am always looking for new uses for ground turkey (it’s always in my freezer! ), and these look so yummy! I love that they’re full of zucchini too. And I really like the addition of sumac to the yogurt sauce! I just want to mention that while these meatballs were delicious and versatile (i used dill and parsley instead of cilantro and mint), the recipe says to use wax paper on the baking tray which is actually not supposed to be used in the oven. Luckily I noticed this quite quickly as the paper started to melt and smoke (http://www.marthastewart.com/269281/parchment-vs-wax-paper). 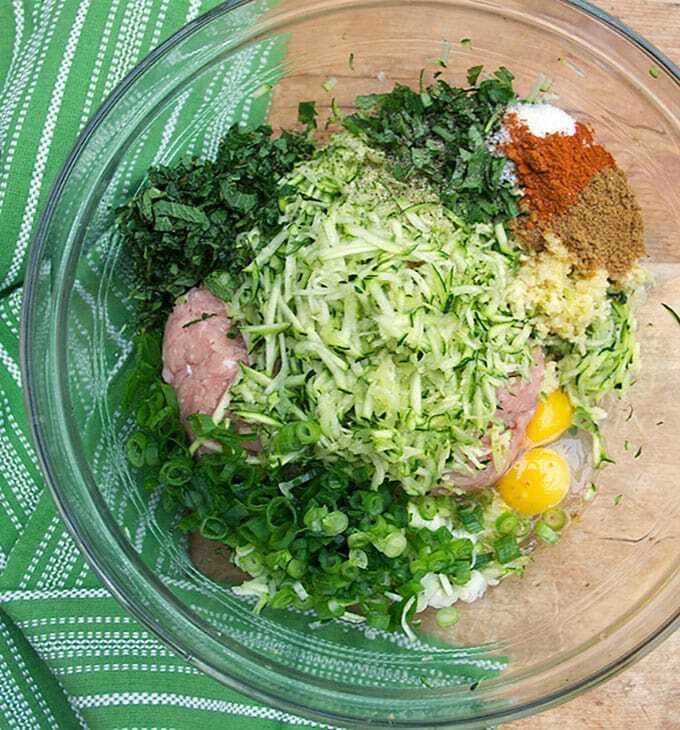 Also, another suggestion would be to shred the zucchini and then put it in a strainer with a bit of salt so that it will drain some of the moisture from the zucchini, as I found that the meatballs let out a ton of liquid as they were cooking. These were quite yummy and well seasoned but I would use parchment paper instead of wax or even just grease the pan. Thanks so much for catching my error with the wax paper Emily! Fixed it!! Do you think it would be ok to make the meatballs in advance (either formed or unformed…?) and then refrigerate them for a couple hours before cooking them? Or should I cook them and reheat? Thanks!! Hi Eric. I think it would be fine to make the meatball mixture in advance and keep it in the fridge until you’re ready for form them. It might even make them easier to form because the fridge will firm everything up. I definitely wouldn’t form them first because the mixture is kind of wet and they would lose their shape. You can also form them and brown them and keep them in the fridge, covered, until you’re ready to finish them in the oven. I think that would work really well! Once they’re browned you can set them up on the parchment-lined tray, cover with foil, store in the fridge, and all you have to do is pop the tray in the oven. You might need a few extra minutes of cooking time if you’re going right from the cold fridge to the oven. Enjoy! Just made them and they turned out great!! Excellent recipe with no need for substitutions/changes. These were absolutely DELICIOUS! I had never used sumac before…it was awesome to try something completely new. I’m always very skeptical of turkey meatballs, but they are so flavorful – I can’t stop eating them! Made these last night and they were yummy! Everybody loved them and perfect for a weeknight meal. is PERFECTO. I love the yogurt sauce you whipped up to go with it. Lots of interesting non Italian spices, which makes it more unique. Bottom line–I like it! I love these Lisa! We are going in for round two tonight. Thank you for expanding my weeknight repertoire!! I came across this recipe on ChowStalker and it is on my list to make this coming week! I’ve spent the last 30 min or more looking through so many more delicious recipes and pinning many to try. Thanks for sharing these recipes – the food and your photos are gorgeous and everything looks delicious! Following up from my last comment…I made these today and they were SOOO good! Perfect blend of spices and so flavorful, complimented by the tartness of the yogurt sauce. These are definitely going into the regular dinner rotation! Thanks Mandy – I’m so glad you followed up to let me know how they turned out! They’re in my regular dinner rotation too! Made these last night. They were awesome! Light, fluffy and utterly delicious. Funny thing, I had never used Sumac before, but just so happens I bought some in a health food store in Tel Aviv last week and was waiting for a recipe calling for it to come around. I made these tonight and I had to leave the kitchen so I would stop eating them! They were delicious! The cilantro and mint were great. I had a few adjustments but it turned out great. I used an egg white instead of a whole egg, and had no sumac, so I grated a little lemon zest into the sauce and I did not have sour cream so I used all greek yogurt. It was easy and delicious. My husband and daughter loved them too. Thanks for a great and easy recipe! Cannot wait to make these. 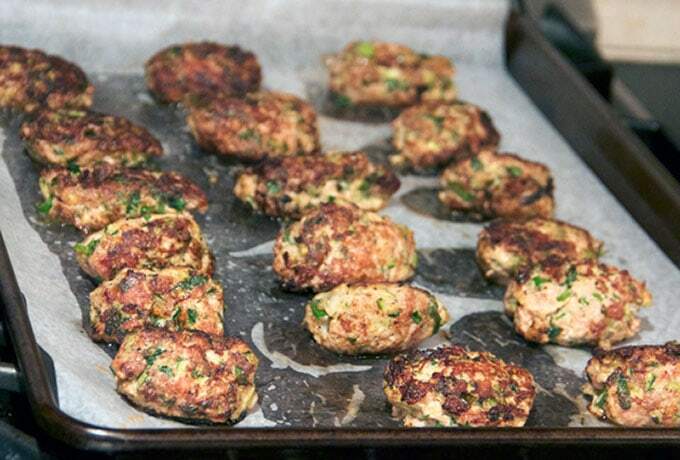 I am a meatball fanatic, and these look healthy as well. Lisa, These sound amazing! Can’t wait to try them out. I’m a sucker for cilantro and cumin! I’ve never tried sumac though…any info or tips about getting/using it? Mindy, I learned about sumac in Istanbul. You can sprinkle it on cucumbers, salads, fish, chicken, dips, or anything that you would sprinkle lemon juice on. It has a bright, tart, lemony flavor. You can order it from Penzeys http://www.penzeys.com/cgi-bin/penzeys/results.html?id=TAPZQtxN or you can find it in the Boston/Cambridge area at Sofra or Formaggio Kitchen. Definitely making these this week! They look yummy.